Jim and Beverly are separating. 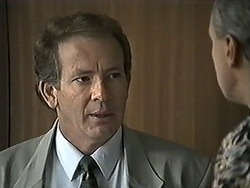 Beverly gives Todd a choice - he either lives with her in the flat behind the surgery or he returns to Adelaide. Matt is telling Melanie about Nolene's death. They are both worried about Toby and wonder what's going to happen to him. Apparently Joe is on his way to Darwin to bring him back to Erinsborough. Jim has had a reasonable night's sleep under the circumstances. Todd is still trying to make his decision. 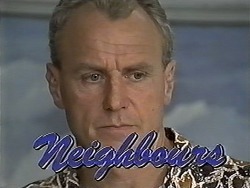 Helen asks Jim if he and Beverly have laid down any ground rules for their separation. She says they should be making concrete plans for a reconcilation. Todd, Cody, Melissa and Josh are sitting around looking depressed. Todd definitely doesn't want to live with Beverly. Cody thinks they should let Todd live where he wants to and treat him like an adult. Melissa suggests tossing a coin to choose. Melanie is humming tunelessly to herself at the desk. Paul rolls his eyes and tells Caroline that he won't be home for dinner tonight, he'll be meeting some local councillors. Christina is going out with Eddie again, so Caroline will be on her own tonight. Paul says he'd hate to see Christina fall for Eddie - he feels he's the type to waltz off and break her heart. Caroline says that's Christina's own business. Helen bumps into Ewan. He tells her he has fantastic news for Beverly - their research project has just got the funding they need. They'll be very busy from now on. Ewan asks Helen directly why she doesn't approve of him. He tells her he isn't deliberately trying to make trouble for Jim and Beverly. Helen says that even if that's true, he has had an influence on what's happened between them. She doesn't elaborate though, saying it's none of their business. Caroline and Melanie are shopping. She listens to a track in headphones and sings along. Everyone in the shop laughs at her dancing and tuneless singing. Then they start clapping! Jim gets home to find Beverly there. She's come to see Todd, but he's not there. She immediately gets angry and Jim rolls his eyes - he was at work after all. BEVERLY: When he's at the flat I'll be able to keep an eye on him. JIM:(losing his rag) Look, is there anything you don't do better than me?! Todd comes in and is dismayed to hear shouting again. Beverly stops shouting at Jim and Todd sulkily tells her that he has no choice but to live with her. JIM:(sympathetically) It's not forever, mate. Jim assures him that his house will always be Todd's home, and he'll always be there for him. Melissa and Cody are discussing Todd. Melissa reckons that Cody is wrapped in Todd. She denies it, but Melissa is sick of Cody hanging around him all the time. Cody reckons she only likes Todd as a friend, and anyway, she's got Josh as a boyfriend. Caroline and Melanie are telling Paul about her loud singing at the shop. Melanie said it was amazing to have an audience(!) Melanie reckons that she always wanted to be a rock star. MELANIE: When I was younger I joined a rock band. MELANIE: It was really weird. After the first rehearsal, the band broke up! Caroline teases Melanie and says that her voice is crying out for proper training. Melanie looks in the paper for a singing teacher. She goes off to ring her, much to Caroline and Paul's horror. Todd, Josh, Cody and Melissa are inspecting Todd's room. They don't think it's that bad, but Todd says he hates it. 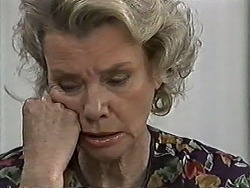 Beverly rolls her eyes and tells him that it isn't the end of the world. Matt comes round looking for Todd. He asks after his leg, much to Beverly's surprise. She wants to know the full story. Beverly immediately over-reacts and tells Todd that he can't do trail-biking anymore. Oh, shut up, woman! Matt tries to reason with her, telling them that they've found them a safer place to ride. The Council has agreed the kids can use it, but Beverly is still banging on that it's unsupervised. TODD:(angrily) First you take me away from my home, then you take my bike off me, what's next? Matt tells Beverly that the Council wouldn't agree if the place wasn't safe. She eventually agrees but says he can only ride when there's an adult there to supervise. Todd says he'll ask Jim to supervise. I don't think that was what Beverly meant! Melanie's new singing teacher is giving her a lesson in breathing. Then they move on to scales. Melanie sings nowhere near the notes. SINGING TEACHER: You have unique voice, dear. Unique in the sense that it's the worst case of tone-deafness I've ever heard. You have my sincere sympathy. The teacher says she must be honest - there's no point wasting their time or money. Melissa, Josh and Cody think Beverly is being a bit uncool at the moment. Cody and Josh mess about and Melissa seems slightly mollified that Cody isn't after Todd. 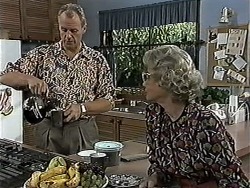 Jim and Helen are discussing Nolene's death. There's a knock at the door and it's Ewan, looking for Beverly. Jim is forced to tell him that they've separated and Beverly is now living at the flat behind the surgery. EWAN: I'm sorry to hear that, Jim. JIM: I bet you are. Jim says that Ewan hasn't helped the situation but Ewan reckons he hasn't done anything wrong. EWAN: You're just not good enough for her. JIM: Oh, but you are? I know your type, Ewan. You may have the nice clothes and the charming manner, but you're the sort of bloke who moves in on another bloke's wife and then disappears. Leaving others to pick up the pieces. Ewan reckons it's all down to Jim's jealousy and he's brought this on himself. EWAN: I care for Beverly. As a matter of fact, it's more than that. The truth is that I love her. I let her go once and I'm not going to make that same mistake again. Ewan walks out, closing the door behind him and in the kitchen, Helen silently despairs.